Sports holiday organized as part of Gazprom’s Football for Friendship program. On April 25 young soccer players from 24 countries celebrated the International Day of Football and Friendship. It was the second consecutive year that the sports holiday was celebrated as part of the “Football for Friendship” children’s social program. In Russia sports tournaments took place in 11 cities across the country, from St. Petersburg to Vladivostok. Moscow hosted the Tournament of Equal Opportunities, supported by the Blind Sport Federation. 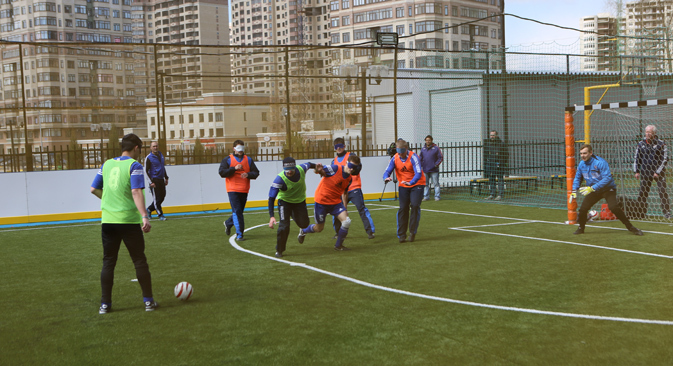 The matches involved the Russian national blind soccer team, representatives of the Moscow street soccer league, a united team of sports reporters and a united team of young journalists. All the participants wore blindfolds on the field to demonstrate the unifying power of sport. “It was the most unusual match in my life. First it was hard and it seemed nothing would work out. But gradually we learnt to hear each other and play as a team,” said tournament participant Misha Ryabovich. “I had a feeling that I listened with my whole body. It was great. During these several hours we all became friends and I realized that everything is up to us – any person can play football and communicate with other people. The most important thing is the desire,” said Ryabovich. Besides friendly matches, the International Day of Football and Friendship featured different master classes and meetings with famous soccer players. Thus in Germany, FC Schalke 04 footballers Julian Draxler and Joel Matip hold open training sessions, while in Serbia participants were invited onto a popular TV show. “While playing sports, children learn communication, understanding, trust and tolerance. the International Day of Football and Friendship unites hundreds of thousands of children from different countries around simple and clear values that can make this world a better place,” said the global ambassador of the program, former German international Franz Beckenbauer. The Football for Friendship international children’s social project is implemented by Gazprom as part the Gazprom for Children program. The project is aimed at developing the youth football game and upbringing tolerance. The annual Football for Friendship international children’s forum is the major event of the project, bringing together 12- to 14-year-old players from top soccer clubs. This year the tournament will be timed to coincide with the UEFA Champions League Final, and will take place in Berlin on June 4-7, 2015.